Part of Antarctica seen with the Landsat Image Mosaic of Antarctica. Mar 22, 2011 • Scientists have created a mosaic of digital images collected from space showing the frozen continent of Antarctica—one of the most remote and least known places on Earth—in amazing detail for the first time ever. 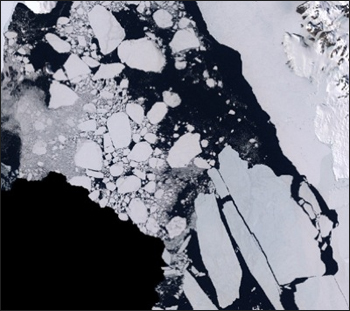 The mosaic is called LIMA, for Landsat Image Mosaic of Antarctica. Antarctica is changing and it matters to everybody on the planet because those changes in the size of the ice sheet affect sea level. And as Antarctica is shrinking, sea level is rising and that will continue and, in-fact, probably intensify. We only know these things because we are looking. And the primary way we look at Antarctica is from space. Scientists know Antarctica is losing ice, said Bindschadler, mainly through observations from space taken by satellite. He talked to EarthSky about the amazingly detailed view of the entire continent of Antarctica called LIMA, short for Landsat Image Mosaic of Antarctica. It is a snapshot of the continent over the course of just a few years, around the year 2000. So it’s already 10 years old, and it provides us that benchmark; this is what Antarctica looked like then. Antarctica is changing – we know that – and in order to quantify those changes and to assess how much it’s changing and where, you need benchmarks to compare what it’s like now with what it was like then. All the other mosaics are really just a pretty picture, a combination of satellite images treated as photographs. But we treated every Landsat image as the scientific data that it is and put it together both for the public to see what Antarctica looks like in true color and high definition but also for scientists to use the same data set to do various scientific studies. Bindschadler said that LIMA even helped scientists assess where penguins were nesting and where they were not. One of the most fascinating pieces of science that has been done with LIMA so far in my opinion, was one that was totally unexpected. And this was one where they used the fact that it is in true color to assess where the penguin colonies, where the rookeries where penguins live are located. Antarctica is a huge continent and most of it still remains unexplored in any sort of detail. So if you’re a geologist wanting to explore a particular mountain range, you’re going to want to look at that mountain range before you go. And it helps you set the questions that you’re going to be addressing and arrange your logistics — where you’re going to go and what you’re going to do and how far you’re going to have to travel and things like that. So LIMA, as much as anything for that kind of planning, serves as a unique base map. And much of Antarctica, as odd as it may sound, is not all that well-mapped. Satellite imagery provides us that basis. And so now we have the entire continent mapped in a consistent and a standard way. But, Bindschadler said, LIMA is not just for scientists. One of the beauties of LIMA is that we put it together not only for scientists, but for people who are not conducting science down there, which is the vast majority of people on the planet, to help them become more familiar with Antarctica. Lima is true color, this is what it would really look like if you were there. It’s sort of akin to hovering around in a helicopter. You can go anywhere you want on the continent and see what it looks like. And it’s a beautiful continent. Here at NASA, we’ve put together a website called lima.nasa.gov, where we’ve concentrated on the education and outreach aspects that LIMA provides. We’re trying to use LIMA as a vehicle to connect people more closely with Antarctica because it is a part of our planet, and it’s an important part of our planet. We need to understand it better to appreciate it and understand that connection between what happens there and what happens in our life. For me, the most important thing that’s happening in Antarctica is that the ice sheet is changing. It’s changing faster and faster. In general, it’s shrinking. The ice shelves in the Antarctic Peninsula, some of them are disintegrating, just disappearing very rapidly. Other outlet glaciers are accelerating and this is causing the ice sheet to shrink. All that ice is going into the ocean and its raising sea level around the world. That’s how it really connects to people around the world, through its contribution to changing sea level. Bindschadler said that as they were putting together and reviewing the LIMA mosaic, he was powerfully stuck by the beauty of the Antarctic continent. It wasn’t a scientific reaction. It was just a human, emotional reaction. I’ve done 15 field seasons in Antarctica. I’ve seen a lot of the continent. But this view of Antarctica from space, where you could see just gorgeous shades of blue and white and deep-blue ocean, it was stunning. I just reacted more on that level and, I realized how powerful this presentation of Antarctica is quite aside from the science that that I do day in and day out. It’s just a drop-dead gorgeous continent. This entry is filed under Carbon and Climate, News, Science.